HELSINKI — China unveiled a heavy-lift launch vehicle it is developing to carry a next-generation crewed spacecraft and power human spaceflight missions beyond low Earth orbit. 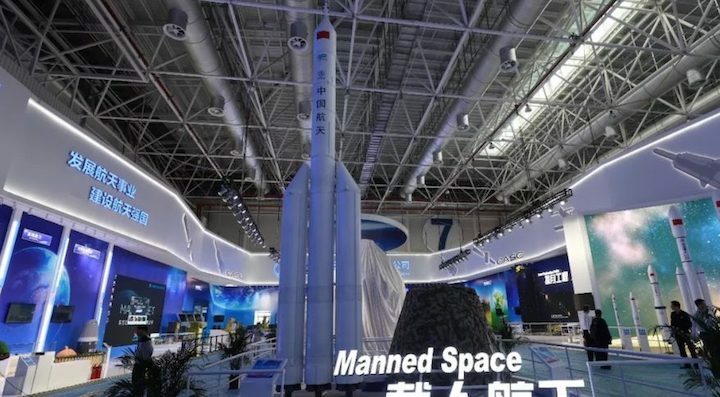 A model of the conceptual design of the unnamed launch vehicle was on display last week at the 12th China International Aviation and Aerospace Exhibition in Zhuhai, southern China, along with other exhibits including a full-scale model of the Chinese space station core module. The launch vehicle plans are being developed by the China Academy of Launch Vehicle Technology (CALT) under the China Aerospace Science and Technology Corporation (CASC), the main contractor for the Chinese space program. Hu Xiaojun, a researcher at CALT, told press at the Zhuhai Airshow that the new launch vehicle is intended for future crewed spaceflight missions using China’s next-generation crewed spacecraft, including lunar missions. At 90 meters, the new 2,000-metric-ton launcher will be close to twice as tall as China’s current most powerful rocket, the Long March 5, with the same 5-meter diamater. It will be designed to send 25 metric tons to trans-lunar injection and 70 metric tons to low Earth orbit. Concepts for future human spaceflight missions were also laid out at a human spaceflight conference in Xi’an, north China, in late October. From slides presented during talks, the conceptual designs of the launch vehicles show clustered engines more reminiscent of the SpaceX Falcon 9 rocket than of typical Long March heritage. Feasibility studies began in 2016 and the new launcher will adopt new design methods and reusability, with work on key technologies ongoing. It will feature an escape system like that used by the Long March 2F rocket, which currently used to send China’s astronauts into orbit. While apparently in the early stages and with the upcoming Chinese Space Station commanding attention and resources, the designs signal a clear intent to develop capabilities for human spaceflight beyond LEO. 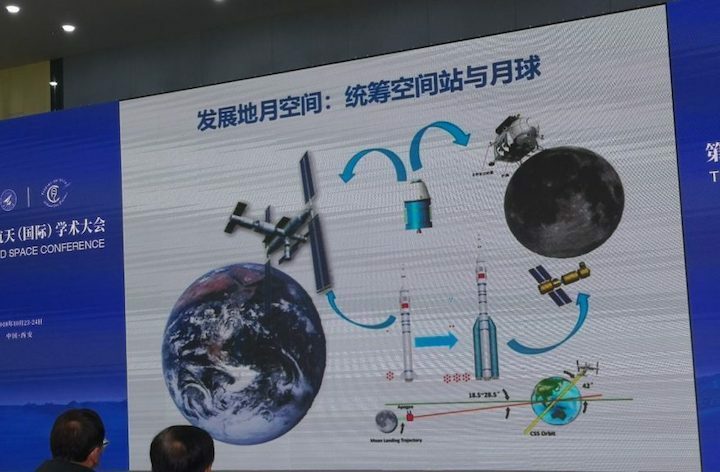 “The development of launch vehicle concepts within China’s space industry is a clear indication that there is serious thought in China about human exploration of the moon,” John Horack, the Neil Armstrong Chair in Aerospace Policy at the Ohio State University, told SpaceNews. 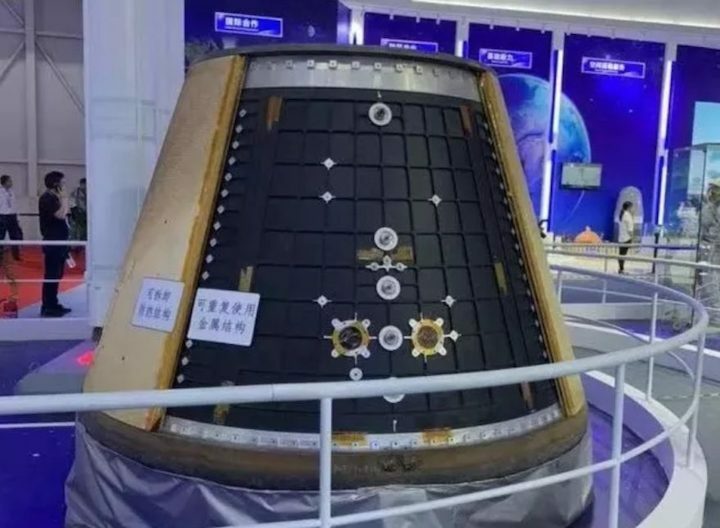 A scale model of the return capsule for next-generation crewed spacecraft, which will be partly reusable and succeed the three-module Shenzhou spacecraft, was also on display in Zhuhai. The two-module spacecraft, which will have an uncrewed flight test in 2019, will consist of a service module and return capsule. Two versions—one 14 metric tons and another of around 20 metric tons for lunar missions—are being developed. 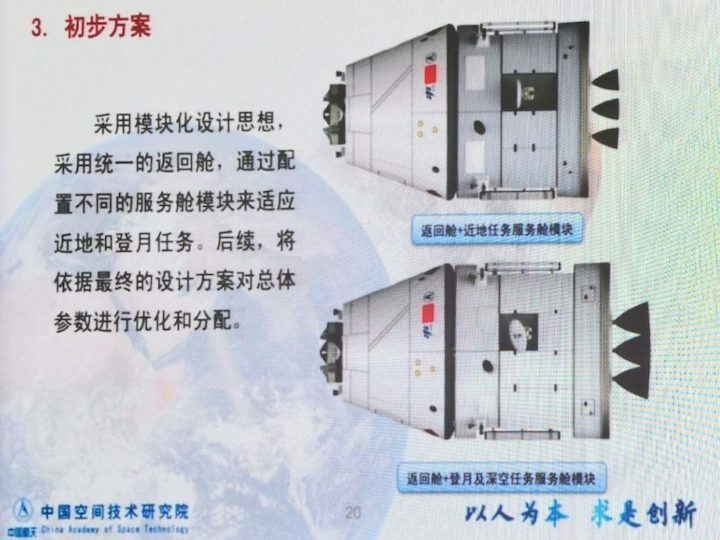 Both the new spacecraft and new crew-rated launcher with their reusability features will be expected to replace the Shenzhou and Long March 2F for low-Earth orbit missions as well as put the moon within reach. China is also in the early stages of development of a super-heavy-lift launch vehicle, the Long March 9, capable of lifting 140 metric tons to low Earth orbit, 50 tons to Earth-moon transfer orbit, and 44 tons to Earth-Mars transfer orbit. The Saturn 5-class rocket would serve for launching infrastructure for lunar and other deep space missions with Chinese officials giving a test flight date of 2028, with a first use stated to be a Mars sample-return mission. “What these designs and technical work do not reveal, at least by themselves, is a solid development schedule, firm funding commitment, dependable infrastructure readiness, and clear political will to go to the moon, especially as an effort that would be solely an enterprise of the Chinese,” Horack says. “China has its own set of internal competitions for funding, its own internal debates about how best to proceed, its own unique version of public sentiment, strong competition within the aerospace sector between organizations, and more. These may all be markedly different from we experience in the United States, but they do occur. And they factor significantly in the future trajectory of anything the Chinese may do in space,” Horack concluded. It is likely that China’s plans will evolve as progress is made and challenges, whether technical, political or otherwise, appear. However, the intended destination appears clear.